PA Classics' U12 Boys Academy 06 defender, Bennett Wehibe, has been selected to represent the United States at the 2018 Gazprom Football of Friendship program this June in Moscow during the 2018 FIFA World Cup. Bennett was selected from within our club to be the representative for the United States in Russia. This year there are 12 year old boys and girls from 211 countries and regions selected to participate. They will spend a week training and playing games, speaking to athletes, and learning about conservation in while in Moscow. Football for Friendship has 9 core values: friendship, equality, fairness, health, peace, devotion, victory, traditions and honor. 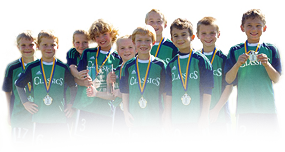 Their goal is to cultivate an interest in a healthy lifestyle and values through the game of soccer. Bennett's team consists of himself, a goalie from Portugal, another defender from Mauritius, two midfielders from Ukraine and Bulgaria, and a striker from Central African Republic. Their youth coach is from Angola. At the end of the week, Bennett will attend the World Cup opening ceremonies and the first game in Moscow. Congratulations and best of luck to Bennett in Moscow this Summer! Below are links to more information.